The rowing machine is one of the more popular types of exercise equipment for more experienced users. There is the guarantee of a low-impact workout in high comfort while pushing numerous areas of the body to their limit. There is the option to be leisurely, with a 10 minute session in front of the TV, or to go all out and work against some tough resistance for an endurance event. Rowing machines definitely seem sportier than some other options. The good news for users is that they also offer a lot of health benefits. The following seven advantages can be enjoyed by all users, no matter their experience levels. This is one of the primary reasons for choosing to have a rowing machine in the home. The short, simple sessions and all-over workout are great for building up a fat-burning routine. Some suggest that you can burn up to 600 calories per hour, so even a 20 minute session would be beneficial. Of course this all depends on the intensity of the program and how far you push yourself. 3) Build the muscles in your arms. There are many areas of the body that get a workout when rowing on a rowing machine. The first one that comes to mind is often the arms as they are pulling on the cord and dealing with all that resistance. The repetitive strokes and timing allow for a good rhythm and it doesn’t take long to see the difference in muscle tone in the arms. 4) Improve your core strength. Then there is the trunk and core of the body. The central zone that provides deep strength around the torso. Rowing machines are great for the lower and middle back because of that repetitive movement with the strokes. This area is engaged for long, consistent periods which leads to better toning, strength, posture and balance. As the resistance increases, so does the impact on this key area. 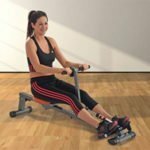 The surprising thing about using a rowing machine is that it provides such a great workout for the quadriceps in our thighs. This helps to tone those muscles and generally strengthen our legs for our fitness and flexibility. We think of our core and arms getting the biggest workout here, but this shows that the rowing machine really is a full-body option. This full body workout is also highly appealing because it allows at-home rowers the chance to work on a number of different joints. You will be moving your knee, hip, shoulders and elbows to get that perfect rhythm. The more you do this, the looser these joint will become and the more flexible you will get. A gentle session on a regular basis can have some impressive results. Finally, there is the benefit for mental and emotional health. There are many studies that talk about the advantages of cardiovascular workouts for releasing happy endorphins. This is essential for stress relief and ongoing treatment of depression. Rowing is particularly helpful because there is something meditative about the repetitive action. This is even more true with water rower that provide the sound of the water. Rowing machine workouts can really help to improve health across the whole body. 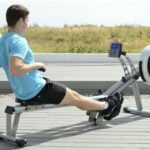 These 7 health benefits of rowing machine workouts show that there is so much more to rowing than building up your arm muscles and potentially losing weight. The intensity on offer means that cardiovascular health can also be improved. 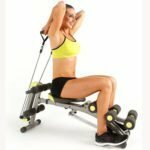 Then there is the fact that the machine works on so many different muscle groups across the body – more than many users may assume. This noticeable physical effects, alongside the mental health benefits, show us why so many people get pleasure from rowing at home.